Mom of Many Words: What's in a name nobody can pronounce? I was walking toward my office on a recent November morning when I ran into an attorney I knew from our building, heading in my direction. As he passed by he smiled and said, "Morning, Janelle." Later on that same day I slipped over to the office of a CPA who works across the hall to drop something off. He was having a conversation with someone about the good old days, and as I opened the door he said, "You know what I mean, right Denise?" My mom gifted me with a name that is not only uncommon but also misspelled and mispronounced a large percent of the time. I like my name, though I didn't as a child, when being different meant being teased. As I grew older it was no longer a nuisance, that is, unless I wanted to see my name spelled out on a keychain or a Christmas ornament along with more common names in store displays. In high school, where your last name becomes the first thing teachers try to pronounce, my given name was lost in the shuffle of an 11-letter surname. 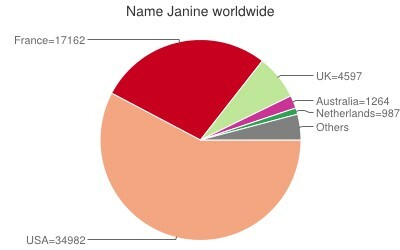 Only the first four letters – Jani – appeared on most forms, which led most teachers to believe my name must be Janice. I know some wonderful people with the name Janice (hand wave to Second Born’s BFF’s mom), but I didn’t want to be called by that name. High school teachers don’t have a lot of patience for a name they can’t pronounce, or remember for that matter. If I was going to be different it wasn’t because they couldn’t pronounce it. I became “J” to several teachers for the bulk of my high school sentence. I mean attendance. When we moved to Maine we also moved to the Land of Janine, or at least that was how it felt to me. Over the years my mother had told me her choice for my name was because she wanted a name close to her own – Jennie. It certainly didn’t come out of a book for common Italian names. In Maine my name is quite popular among the French-Canadian population. The first time someone pronounced it without faltering I was shocked. When they spelled it correctly without any prompting I thought I was on Candid Camera. Growing up not being able to find my name easily on anything other than custom made items should have deterred me from putting the same burden on my own children. Not so much. First Born will occasionally post a shared message on social media about knowing how it feels to never find her name spelled correctly. While her name itself is not uncommon, the spelling is just unusual enough to fall into the skipped-over-on-display category. I should feel bad but I have to admit, the quirkiness of its spelling suits her uniquely beautiful personality. We were less creative (and more tired) when Second Born came along. She can find her name on just about anything personalized. She also had her own unique personality from the get-go, and a common name has surely not made her fade into the background. All I know is that neither of them seemed scarred for life because of their names. We included middle names with a certain amount of emphasis for when we need to call them out for something. It’s difficult to get the point across that you’re miffed when you slap a soft middle name on like Angel or Bunny. If they have children of their own I’m sure our kids will play the name game when they have to agree on a moniker for their offspring. Will they use family names or choose something distinctive? Only time will tell. I can pretty much guarantee no matter what names they decide on, their kids won’t always be Angels.